To continue their 10th Anniversary year Sounds Familiar's next production will be Broadway Nights. This is a selection music from famous Broadway musicals, some old and some new. The group will present this show in November of this year. Check back for confirmed dates. We are currently looking for more singers and dancers to join us. The 10th Anniversary show featuring many routines from previous productions as well as other showstopping tunes from various Broadway and West End musicals. 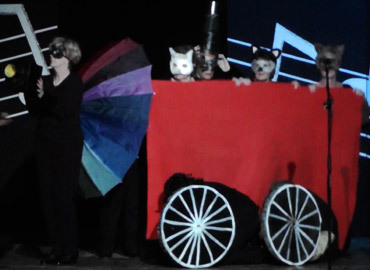 Featured musicals included Cats, Chess, Joseph, Anything Goes and more. Music of the Night had everything for musical theatre lovers, from Rodgers & Hammerstein to Andrew Lloyd Webber. The show featured many of the best loved musicals including Fiddler on the Roof, Jesus Christ Superstar, Oliver, Sound of Music, Phantom of the Opera and more.